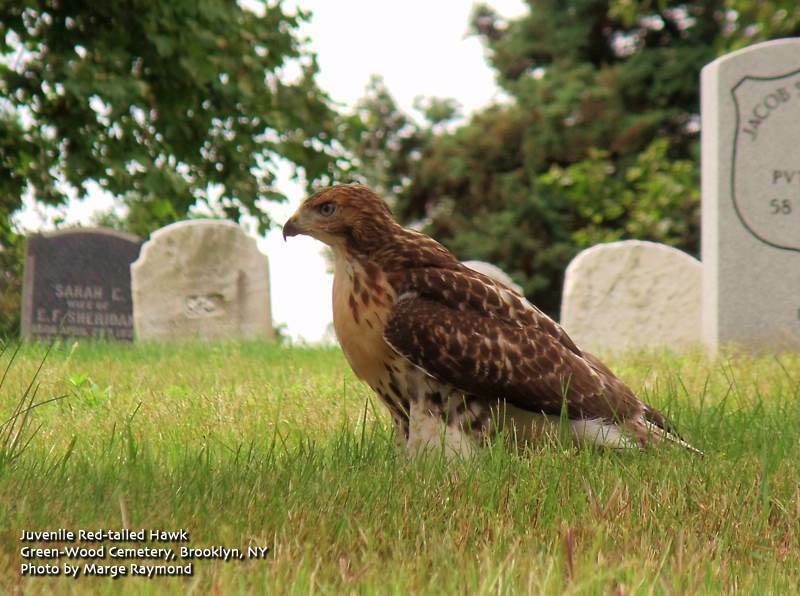 Below are some photos that Marge took of the Green-Wood Cemetery juvenile Red-tailed Hawks. Dr. Jeff Masters, co-founded of the Weather Underground, takes a look back at the global weather for 2010-2011, in what was likely the most extreme weather since 1816. "Every year extraordinary weather events rock the Earth. Records that have stood centuries are broken. Great floods, droughts, and storms affect millions of people, and truly exceptional weather events unprecedented in human history may occur. But the wild roller-coaster ride of incredible weather events during 2010, in my mind, makes that year the planet's most extraordinary year for extreme weather since reliable global upper-air data began in the late 1940s. Never in my 30 years as a meteorologist have I witnessed a year like 2010--the astonishing number of weather disasters and unprecedented wild swings in Earth's atmospheric circulation were like nothing I've seen. The pace of incredible extreme weather events in the U.S. over the past few months have kept me so busy that I've been unable to write-up a retrospective look at the weather events of 2010. But I've finally managed to finish, so fasten your seat belts for a tour through the top twenty most remarkable weather events of 2010. At the end, I'll reflect on what the wild weather events of 2010 and 2011 imply for our future." Matthew Wills has a nice report on the endangered "Four Sparrow Marsh" on his blog here. 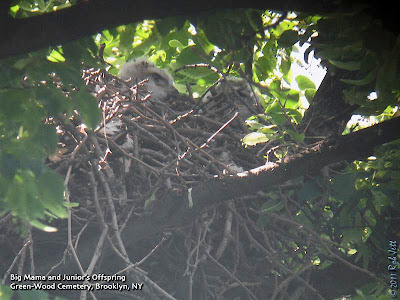 It has been two or three weeks since Green-Wood Cemetery and Prospect Park's juvenile Red-tailed Hawks left their respective nests. 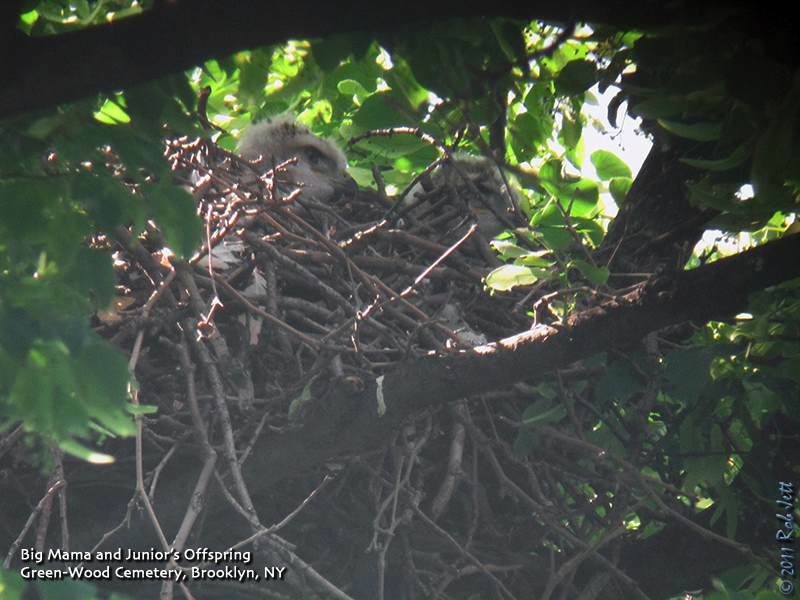 Marge called me with an update from the cemetery and today I tried to track down the pair of young raptors from the Nelly's Lawn nest in Prospect Park. After dropping off a book at the Brooklyn Public Library I walked into Prospect Park at the entrance adjacent to the statue of James Stranahan. From there I planned on walking south, passed the Vale of Cashmere, to Nelly's Lawn. Last year's fledglings from the meadow's nest spent much time in Elizabeth's Tuliptree or the stretch of trees immediately to its north. Randomly scanning the trees isn't a very good strategy for locating the young hawks. I've found that relying on sound works much better. Songbirds make an assortment of alarm calls when a red-tail is perched nearby. Robins and starlings are the most abundant birds in the park at this time of year and their vocalizations always point the way to the hawk's perch. In addition, at this date the juvenile hawks are still receiving meals from their parents so they can sometimes be found when they start to whine for food. The adult hawk soared over the Long Meadow in widening circles, heading to the northeast. Within a minute or two, the crying juvenile took off flying towards Nelly's Lawn. I could see the parent high in the sky over the Brooklyn Botanic Garden. The young hawk is clearly still learning the details of flight and made no attempt to catch up with her parent. Instead, she just landed midway to the top of Elizabeth's tuliptree and continued her begging cries. Every Saturday, 12 - 1:30 p.m.
Saturday, July 2 - Sunday, July 4, 1 - 3 p.m. Known as a symbol of strength, courage, and pride, the eagle is one of our country’s most recognizable icons. Saturdays in July and August, 1 p.m. and 3 p.m. Learn how to fish at Prospect Park! Sunday, July 3, 8 a.m.
Meet the amazing local birds raising families in Prospect Park on this expert-guided walk. Start your Sunday morning surrounded by nature! Every Saturday and Sunday, 3 p.m.
Guide: Gabriel Willow With New York Water Taxi Meet at South Street Seaport's Pier 17. Experience the wonders of New York's famous harbor at sunset and see some of the three thousand herons, egrets, and ibis nesting on islands around the harbor. Register with New York Water Taxi online by clicking here, or by phone at 212-742-1969. Limited to 100. $35 for adults, $25 for children under 12. Saturday, July 2, 2011, 8:00 a.m. to 10:00 a.m. The morning’s focus will be on the breeding birds that may be present in the fields and hedgerow such as Willow Flycatcher, Indigo Bunting, Orchard Oriole and any other surprises that may be present. Meet in the parking lot on Hylan Blvd. It may be early in the morning, but the birds will be singing before the heat of the day. We need to listen for their songs and call notes as we wander the trails. For more information call Howie Fischer at (718) 981-4002. You can also send reports and digital image files via email to nysarc1 [AT] nybirds.org . Greetings. This is the New York Rare Bird Alert for Friday, June 24th, at 6:00pm. The highlights of today's tape are the presence of a HOODED CROW on Staten Island; WILSON'S PHALAROPES, MANX SHEARWATER, CORY'S SHEARWATER, SOOTY SHEARWATER, and GLAUCOUS GULL. Certainly most of this past week's attention has centered around a HOODED CROW, present through today at Great Kills Park on Staten Island. An only slightly migratory Eurasian species, this crow's occurrence here is equally as enigmatic as appearances of various exotic waterfowl and other odd jobs in our area. The only two plausible explanations for its presence are that it escaped from somewhere, as they have been kept in captivity, or it hopped a ship and got a ride across the Atlantic either under its own volition or in some restrained manner. Nevertheless, it is a striking crow. To look for it, enter Great Kills Park from Hylan Boulevard, and follow Buffalo Street to the end of the pavement. Park in the lot on the left, and walk the gravel road to Crooke's Point. At the end of this road is a permit-required parking lot for fishermen, and the crow has been around this lot or adjoining woods and beach. It apparently has been present for two weeks or more. NYSARC will ultimately address this bird's status. If at Great Kills, also look for the adult WHITE IBIS that had been in the marshy area on the right, just before the Ranger Station, not reported since May 28th. At Jamaica Bay Wildlife Refuge, three WILSON'S PHALAROPES showed up at the south end of the West Pond last Sunday, these including a striking female along with two males. At least five WHITE-RUMPED SANDPIPERS were also on the West Pond. On Wednesday evening two ROYAL TERNS and a few ROSEATE TERNS were at Democrat Point at the western tip of Fire Island, and a couple of WILSON'S STORM-PETRELS were off Robert Moses State Park, lot 2, on Saturday. Further east, on the North Fork, the lingering GLAUCOUS GULL was seen as recently as Monday around the ferry terminal at Orient Point. At Cupsogue County Park in West Hampton Dunes, morning and evening sea watches last Saturday produced a MANX SHEARWATER in the morning and SOOTY SHEARWATER and some WILSON'S STORM-PETRELS. On the Cupsogue flats in the afternoon were two ROYAL TERNS and two BLACK TERNS, and at least 15 WHITE-RUMPED SANDPIPERS were among the shorebirds lingering between there and Pike's Beach just to the east. On Monday the continually shifting numbers of shorebirds and nonbreeding terns included fewer WHITE-RUMPS, but two LEAST SANDPIPERS, plus one BLACK TERN, four ROSEATE TERNS, and seven FORSTER'S TERNS. On Tuesday an AMERICAN BITTERN was flushed from the marsh there. At Montauk Point Sunday, a moderate number of birds included a CORY'S SHEARWATER working among some fishing boats and 54 COMMON EIDER, with six more COMMON EIDER around Montauk Harbor. Four WILSON'S STORM-PETRELS and two NORTHERN GANNETS were off Culloden Point and about 30 WILSON'S STORM-PETRELS were present off the Camp Hero Overlook at Montauk today. 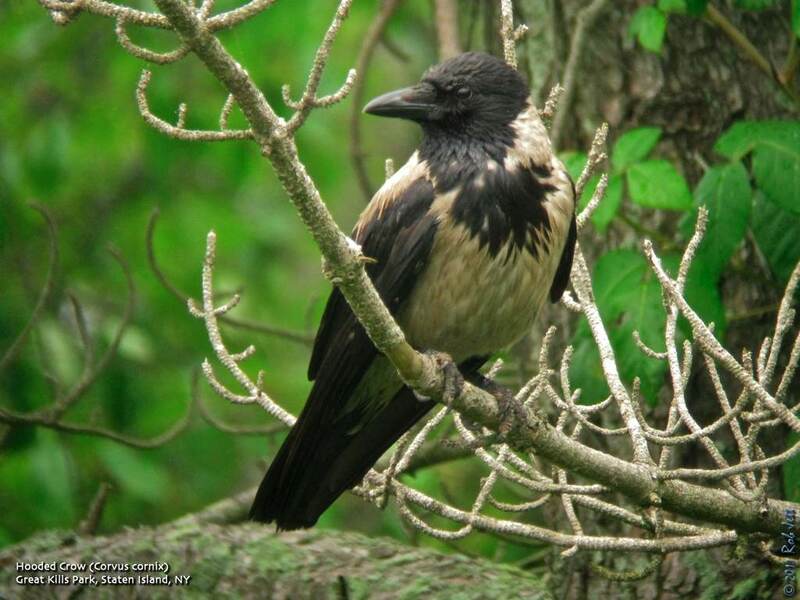 This Hooded Crow has taken up residence in Staten Island's Great Kills Park. How it arrived in North America is a mystery. It may be a year or two before the experts rule on whether it arrived on its own and can be considered the first record for this species in North America, either way, it's a cool bird and worth going to check out. 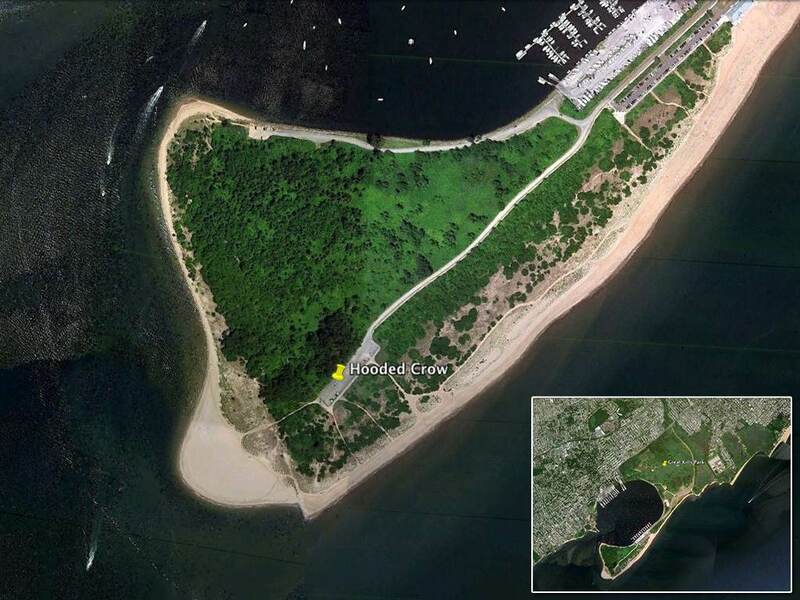 A Hooded Crow has recently appeared on Staten Island. If it is determined to be a "legitimate" bird, that is, one that wasn't an escaped zoo bird, or had hitched a ride on a ship, it will be the first record of this Eurasian species in North America. I've seen Hooded Crows while vacationing in Italy and posted a photo of one here spotted at the Villa Borghese. This bird has an interesting range that stretches from Scotland in the West and across Asia to the East. They are also rare in Greenland. 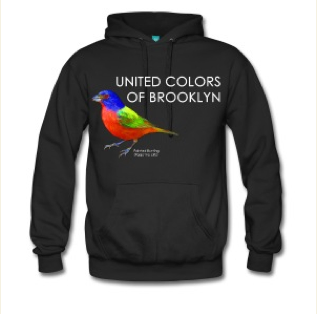 It may be an exercise in futility, but I can't help speculating on how this bird might have arrived in New York City. The range map to the right shows that they do stray across open water and into Greenland periodically. In addition, some populations do actually migrate for fairly long distances. It's not inconceivable that this individual made its way down the coast of North America after tiring of the accommodations in Greenland. There are some people who will assume that this bird just hitched a ride on a ship, which is also believable, especially considering the amount of shipping traffic that goes in and out of New York and New Jersey ports. I think it has been ruled out that it is an escaped captive bird. It doesn't have any bands on its legs, plus, his feathers aren't worn in a pattern that would be consistent with a caged bird. When Shane called me in the morning to see if I was interested in running over to Staten Island to look for the bird, I jumped at the opportunity. "The nominate subspecies breeds on Isle of Man, Ireland, Scottish Hebridean islands, Scotland mainland and disjunctively across northern Denmark and Scandinavia; for example, the subspecies is often seen along coastal areas of Islay where rocky and sandy coves alternate. Historically it is an autumnal visitor to the coast of eastern England, particularly Lincolnshire.(Beddard. 1906) where it feeds on shellfish in the mudflats." While we were present he returned to the beach a couple of times and foraged along the shore. He perched on a small rock jetty for quite a while, but also jumped down between the rocks occasionally, returning with some small bits of food. There is now free ferry service that runs to Governor's Island from Brooklyn. The ferry is at Pier 6 in Brooklyn Bridge Park, which is at the end of Atlantic Avenue near Columbia Street. Robin and I rode our bikes down to the ferry then spent a couple of hours pedaling around the island. The website "Yale Environment 360", a publication of the Yale School of Forestry and Environmental Studies, just posted a very interesting piece on hydrofracking, an issue that all residents of New York should be aware of as it could impact everyone of us. Forum: Just How Safe Is ‘Fracking’ of Natural Gas? New technologies for freeing natural gas from underground shale formations have led to a hydraulic fracturing boom across the U.S. that is now spreading to other countries. In a Yale Environment 360 forum, eight experts discuss whether “fracking” can be done without serious harm to water and air quality and what environmental safeguards may be needed. Depending on your point of view, hydraulic fracturing of natural gas is either a blessing that will help provide new sources of energy for the coming century, or an environmental curse that threatens water and air quality in communities across the U.S., Europe, and elsewhere. Both sides in the debate agree on one thing — natural gas reserves stored in subterranean shale formations are extensive. But beyond that proponents and opponents of fracking hold widely divergent views. Yale Environment 360 asked industry officials, scientists, and conservationists to answer the following two-part question: “Can hydraulic fracturing of gas and oil reserves in shale formations be done on a large scale without significant negative impacts on water supplies, air quality, and local communities? As fracking continues to expand rapidly, do you believe more stringent federal and state regulations are needed and, if so, what should they be?” Among the wide range of views, one theme emerged: Shale gas fracking in the U.S., which to date has been less strictly regulated than other sectors of the oil and gas industry, is almost certainly headed for a period of tougher federal and state environmental controls. Robert Howarth, professor of ecology and environmental biology at Cornell University, and co-author of a recent study of methane emissions from hydraulic fracturing. The development of natural gas from shale formations using high-volume, slick-water hydraulic fracturing is a new technology, first applied in Texas only in the past 10 years or so and in Pennsylvania only in the past 3 to 4 years. Only this year have objective, scientific studies on the consequences been published, and these are alarming. The best evidence indicates widespread contamination of drinking water wells within 1 kilometer of gas wells, and the rate of venting and leakage of methane to the atmosphere is sufficient to give shale gas a larger greenhouse gas footprint than any other fossil fuel. In Texas, flow-back fluid wastes are disposed through deep injection into old abandoned wells; but such wells are not available in Pennsylvania in sufficient number, and industry in Pennsylvania has yet to find a safe method of disposal. Some of this waste continues to be “treated” in municipal sewage plants in New York and Pennsylvania, despite strong evidence of downstream water quality problems. Widespread air pollution with compounds such as the carcinogen benzene is prevalent in both Texas and Pennsylvania. Current regulation by states is clearly not sufficient. Is federal regulation the answer? Perhaps, although it may not be possible to apply high-volume, slick-water hydraulic fracturing without excessive pollution and risk. A national moratorium is necessary — time to step back and better study the risks to water quality, air quality, and global warming. Only once such studies are completed can society begin to analyze what sort of regulation might be sufficient. Lee Fuller, executive director of Energy in Depth, an association of companies involved in hydraulic fracturing of natural gas and oil. Over the past 60 years, more than 1.1 million wells have been enhanced thanks to the fracturing process — oil wells, gas wells, but also water wells and even geothermal wells. Some folks like to argue that harvesting natural gas from shale is different, that it requires a dramatically different and particularly risky form of fracturing to make it work. But they’re wrong: The fundamental mechanics of fracturing a well haven’t changed since the first one was stimulated in Kansas back in the 1940s. It’s true that we use more water today. But it’s also true that we need to drill a lot fewer wells, in large part thanks to advances in horizontal drilling technology. Should the fracturing process be regulated? Again, the answer is yes. And again, the good news is that it is already ably regulated in each and every state in which it is deployed. On the federal level, laws such as the Clean Water Act and Safe Drinking Water Act are also part of this oversight process, despite what you may have read. The upshot? An opportunity to convert the potential of shale into a safe and steady stream of jobs, revenue, and opportunity for decades to come — at a time and place when it couldn’t be needed more. Amy Mall, senior policy analyst for the Natural Resources Defense Council. We know that industry already has better technologies and cleaner approaches to reduce the environmental and health impacts of large-scale oil and gas production, including hydraulic fracturing. But for the most part they are not being required. And there still remain many unknowns. We need scientific analysis and data on the full impacts to water supplies, air quality, and local communities — how they occur, and how they can be prevented or reduced. Until we have a better understanding of the risks, we can’t know with certainty if oil and gas reserves in shale formations can be accessed without significant impacts. The oil and gas industry should be required to comply with the same environmental safeguards as any other industry. Right now, it’s not, and that’s putting people and communities at risk. The nation desperately needs stronger regulations for oil and gas production at both the federal and state levels. Since companies are not using the best available technologies everywhere they operate, these practices need to be standardized. Regulations must also have robust enforcement provisions, to ensure there are meaningful incentives for companies to follow the law. To start, there are huge loopholes in our bedrock federal environmental laws that favor only the oil and gas industry. These loopholes — including ones in the Clean Water Act, Safe Drinking Water Act, and Clean Air Act — must be closed. This industry should not receive special treatment. State regulations can and should go farther to address the needs of each individual location. The evidence clearly shows current regulations are not strong enough to prevent drinking water contamination, toxic air pollution, and other threats. David Burnett, petroleum engineer and director of technology at Texas A and M University’s Global Petroleum Research Institute. The vast majority of wells completed in the last 10 years have had no significant impact on the environment. True, a very few well operations have had problems because of errors in operations. That is why our university and others have created the Environmentally Friendly Drilling Program (EFD). Drilling programs that follow the best management practices recommended by EFD have an extremely small and temporary impact on the environment and the community. The EFD Scorecard offers a way whereby public officials and other stakeholders can tell whether or not a company is following those precepts. For example, drilling operations have been conducted in downtown Amsterdam, Netherlands in a parking lot of a hospital. The drilling rig was a new design that has essentially zero emissions. [What we need is] not more stringent regulations, but more appropriate regulations. And these can best be set at the state level by collaboration with stakeholders and industry. The gas shale drilling industry works to design and operate cost-effective drilling programs, while minimizing the impact of its operations on the environment. With the right technology, the industry can meet both of those goals. We also want the public and regulatory officials to know how we operate, how we protect the environment, and how we abide by the regulations. (An example of this is the new Frac Focus web site, http://fracfocus.org, a hydraulic fracturing chemical registry website, sponsored by two industry associations.) Appropriate regulations, based on sound science and engineering principles — developed by consensus — are welcomed. Erik Schlenker-Goodrich, director of the Western Environmental Law Center’s Climate and Energy Program, as well as one of the center’s attorneys. No. At the massive scale envisioned by shale gas proponents, our land, air, water, and communities will be further sacrificed. This is as much a consequence of our dysfunctional policymaking apparatus as it is of the innate risks and impacts associated with shale gas. Put simply, shale gas — a form of natural gas — is a fossil fuel, and fossil fuels are dirty fuels. This is not to say that there is no role for shale gas. There is. But that role is far more limited than the hype suggests. Used, for example, to power existing, underutilized gas-fired power plants as a way to immediately supplant aging, highly destructive coal-fired power plants in the near term, shale gas makes some sense. But, given geologic, financial, environmental, and other limits — as well as the absence of any comprehensive plan to rapidly transition our country to energy efficiency and clean energy — it is quite dangerous to give shale gas anything more than a limited role. At a bare minimum, and to better constrain shale gas within acceptable limits, I’d propose a far stronger legal framework based on three key principles. First, natural gas development must complement and speed, not undermine, our transition to energy efficiency and renewable, clean energy. Second, we must move beyond ineffective, business-as-usual “mitigation” and embrace meaningful public health and environmental safeguards that are enforceable not just by government, but by the citizens who will have to deal with natural gas development each and every day. And third, we must prohibit shale gas development in communities, key water resources, and iconic or ecologically important landscapes. Richard Ranger, senior policy advisor at the American Petroleum Institute (API), an industry association. Can hydraulic fracturing be employed widely without causing significant harm? The evidence shows it already has. Hydraulic fracturing is a 60-year-old technology that has been used safely in more than 1 million wells. The industry and regulators are doing a good job managing its risks, and there has not been a single documented instance of groundwater contamination of subsurface formations from hydraulic fracturing. As consideration is given to more regulation of hydraulic fracturing, we should focus on building on the existing effective system of oversight. That is already happening. States are reexamining their regulatory programs, and the industry, through API, has produced new best practices that provide operators with the most advanced guidance for safe use of hydraulic fracturing. The industry is also making it easier for company disclosure of the chemicals in hydraulic fracturing fluids. New federal regulations are unnecessary. The states have experience regulating all aspects of drilling, including hydraulic fracturing. They have personnel with expertise in their state’s geology, groundwater resources, and oil and natural gas operations. They have every incentive to ensure state rules protect health and the environment for their citizens. Hydraulic fracturing is essential to developing the vast shale gas reserves that will help meet the nation’s future energy demand. Increased reliance on these resources for our energy needs will reduce air pollution and carbon emissions and generate vast numbers of new jobs and large amounts of revenue for government. Kevin Anderson, director of the energy program at the Tyndall Centre for Climate Change Research, and lead author of a recent report on hydrofracturing in the UK. My principal concerns (and expertise) have been on the climate change implications of yet another unconventional fossil fuel. From my reading of the situation, the process of fracking within shale rock does not have the same degree of homogeneity as is typically the case in much of the production of both natural gas and oil. In this regard, it is difficult to envisage any set of simple and generic procedures or protocols that will ensure sufficient environmental (and human) protection. Consequently, and with our current understanding, each fracture site (at least beyond a few kilometers separation) needs to be considered individually on its particular merits. From a UK perspective, I would be broadly happy for our responsible body, the Environment Agency (EA), to make the decision on whether site-by-site fracking should be permitted — provided the EA comes under absolutely no external pressures to make a decision one way or another and that it has the additional income stream and personnel (both challenging issues at this time) to permit it to undertake the necessary level of detailed investigations to make a fully informed decision. Whilst I may not be an expert on fracking, I do have a detailed understanding on climate change — and in that regard the only responsible action with regard to shale gas, or any “new” unconventional fossil fuel, is to keep it in the ground — at least until there is a meaningful global emissions cap forcing substitution. In the absence of such an emissions cap, and in our energy hungry world, shale gas will only be combusted in addition to coal — not as a substitution, as many analysts have naively suggested. Ben Grumbles, president of the Clean Water America Alliance, a Washington, D.C.-based nonprofit educational organization working on issues of water sustainability. Hydraulic fracturing can be “safe” when done in the right place, on the right scale, with the right safeguards, and as part of a “drill, maybe drill” philosophy. The record is clear. Hydraulic fracturing has been done safely in many places over the years (and has great economic and energy potential), but the scope of review has been limited and the cumulative impact of the unprecedented “Shale Rush” on local water supplies, air quality, and watershed ecosystems should get more attention and research dollars. Local and national policymakers need an honest assessment of potential safety risks and a more complete life cycle analysis of the water quality and quantity considerations. The U.S. Environmental Protection Agency’s current $12 million study of hydraulic fracturing is an important opportunity to review the growing evidence of methane migration, which seems much more related to faulty drilling practices, as well as other key issues in the debate. With participation from federal agencies, key stakeholders, and legal scholars, state officials should develop model codes and frameworks for more effective state regulation. And Congress should revisit the 2005 Energy Policy Act’s exemption of hydraulic fracturing from regulation under the Safe Drinking Water Act. The voluntary national registry for fracturing fluids is a good start and needs to grow. Federal research should fill necessary knowledge gaps and sort out information from misinformation. Key areas should include the amounts and impacts of total dissolved solids in fracking-flowback waters and their impacts on surface waters and treatment plants. A major priority should be closed-loop systems and the development of the most effective and affordable technologies to recycle fracking fluids. How can the large water footprint of hydraulic fracturing — which can exceed 5 million gallons per well — be reduced? 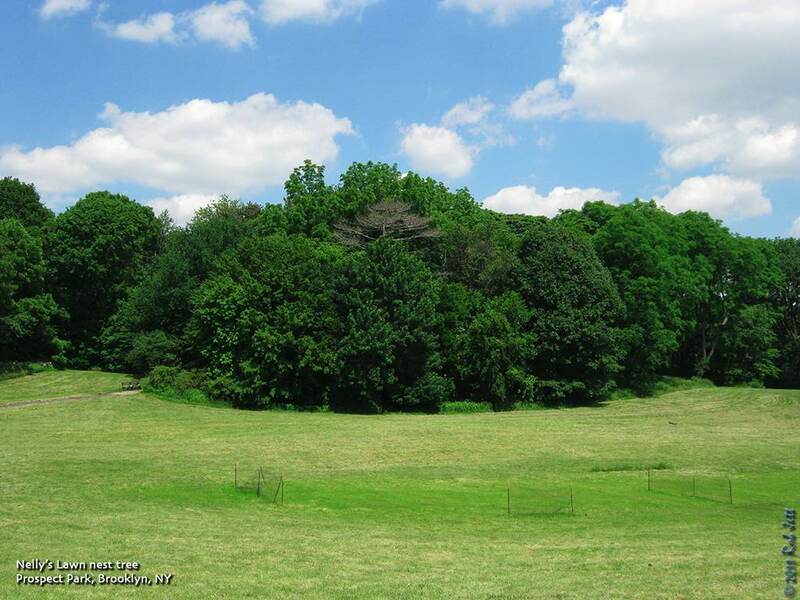 Discover the Prospect Park you never knew! Meet birds and other wildlife on this walk, guided by a naturalist. Guide: Gabriel Willow With Green-Wood Cemetery Meet at the cemetery entrance at 5th Ave and 25th St., Park Slope, Brooklyn. While it might seem an odd place to go birding, Green-Wood Cemetery is rich in both history and wildlife. It is also the highest point in Brooklyn, affording marvelous views. We will explore its environs in search of spring migrants and its most unique avian residents: the huge flocks of brilliant green monk parakeets that nest there. Native to South America, these charming immigrants are surprisingly hardy and flourish even in our harsh winters. Limited to 15. $25 Click here to register! Description: Four Sparrow Marsh in Mill Basin, Brooklyn is one of the last remaining salt marshes on the north shore of Jamaica Bay. The marsh provides critical filtration services for the bay and is habitat for numerous nesting and migratory bird species. Consisting of mudflat, salt marsh, upland meadow, and a sprinkling of deciduous trees, the Four Sparrow landscape hosts a mixture of native and invasive plant species. The marsh’s meadow is currently the site of a proposed retail center which threatens to degrade if not destroy this nearly unique corner of the city. Sunday, June 26, 2011, 12 p.m. to 2 p.m. Entrance off Cornelia Street off Hylan Blvd. Meet at the farthest reach of the parking lot by the restrooms. Explore this living forest of ancient trees and see re-creation at work Marvel at this wonderful park of seashore and pond, hills and ridges, streams and cool arboreal woods. Greetings. 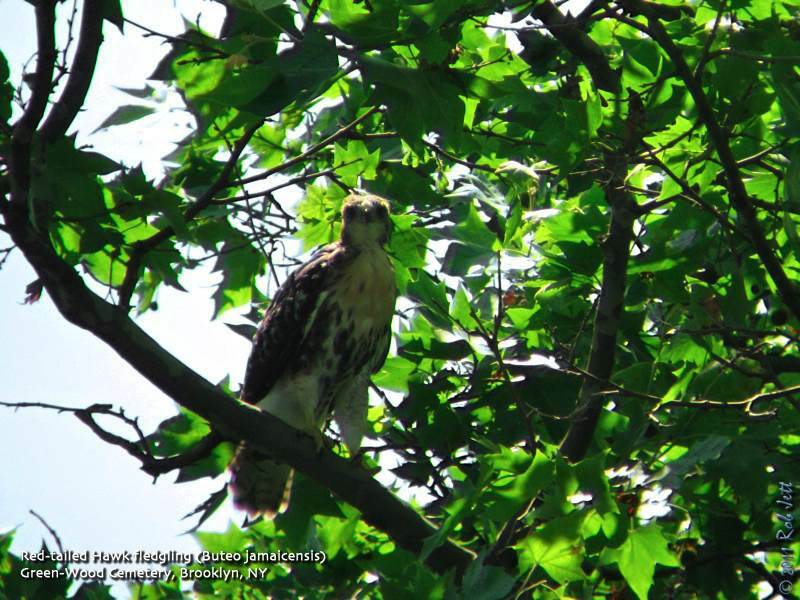 This is the New York Rare Bird Alert for Friday, June 17th, at 7:00pm. The highlights of today's tape are ARCTIC TERN, CORY'S SHEARWATER, GREAT SHEARWATER, SOOTY SHEARWATER, a continuing influx of LESSER BLACK-BACKED GULLS, and a well offshore report of FEA'S PETREL. The season's first ARCTIC TERN, a first summer bird, showed up Thursday on the mud flats at Cupsogue County Park in West Hampton Dunes. This is the site that has produced multiple Arctics the past few summers. 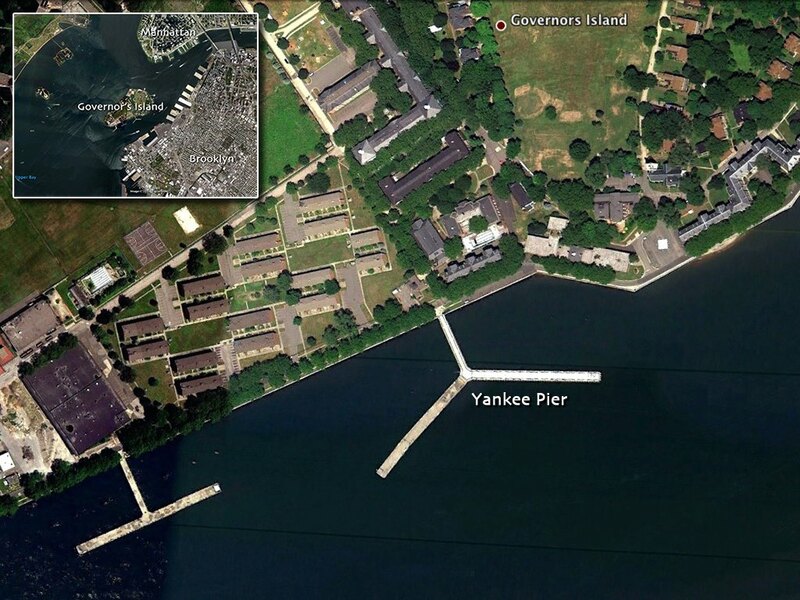 The flats are north of the large parking lot at Cupsogue, and seem to be most productive on a rising tide. A visit generally requires wading through soft mudflats, which also entertained various other terns, and a selection of shorebirds. Coupled with nearby Pike's Beach, other birds present Thursday featured ROSEATE TERN, ROYAL TERN, over 50 RED KNOTS, 15 WHITE-RUMPED SANDPIPERS at Pike's, and various other shorebirds. This area is generally also decent for sea watching. A morning sea watch from Robert Moses State Park field 2 last Saturday produced single CORY'S and GREAT SHEARWATER and two unidentified shearwaters, while a boat off Fire Island last Friday noted single SOOTY SHEARWATER and WILSON'S STORM-PETREL. Bigger pelagic news however comes from a research boat well out in the Atlantic. At a point just over 100 nautical miles south of Long Island in the vicinity of Hudson Canyon on Tuesday, a FEA'S PETREL was well seen. To be determined is which state it was in. Nearby were also four AUDUBON'S SHEARWATERS with CORY'S and GREAT SHEARWATERS. The number of immature LESSER BLACK-BACKED GULLS along the south shore of Long Island remains interestingly high. Reports this week mentioned seven at Jones Beach West End field 2, and three at Robert Moses State Park field 5 on Sunday, and five were at Pike's Beach on Thursday. An ACADIAN FLYCATCHER was encountered again at Connetquot River State Park on Sunday. The Greenwich-Stamford summer bird count, including a good portion of Westchester County, was held last weekend, and in fairly poor weather managed an average 132 species. Highlights included 8 GLOSSY IBIS, interesting waterfowl including AMERICAN WIGEON, RING-NECKED DUCK, GREATER SCAUP, WHITE-WINGED SCOTER, LONG-TAILED DUCK, RED-BREASTED MERGANSER, and a family of HOODED MERGANSERS. VIRGINIA RAIL, SORA and AMERICAN COOT were unusual, as were some lingering shorebirds, including a DUNLIN. A GLAUCOUS GULL was notable, and about a dozen BARRED OWLS were tallied. YELLOW-BELLIED SAPSUCKER was new for the count, bringing the all-time count species total to 239. Interesting passerines included 3 ACADIAN FLYCATCHERS, a pair of BLUE-HEADED VIREOS, 5 COMMON RAVEN, HOODED WARBLER, and BOBOLINK. With breeding season made even more difficult for the birds due to the unseasonable weather we've been having, please remember to be very cautious and unobtrusive when visiting nesting sites. 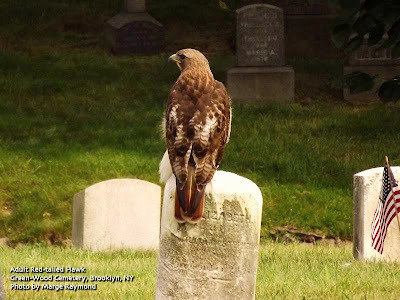 Late Wednesday afternoon I biked over to Green-Wood Cemetery to check on the Red-tailed Hawk nest. While there I also stumbled on another interesting resident. The air in the cemetery is so sweet with the fragrance of linden flowers that it reminds me of the perfume counters in Macy's. The Green-Wood Cemetery Red-tailed Hawk nest is near the top of one of these trees, which is now blanketed in clusters of fragrant, yellow flowers. The dense blooms obscure all but a single, limited vantage point for viewing the nest. 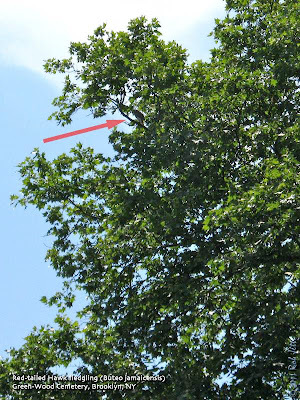 When I arrived there didn't appear to be either of the young hawks on the nest or branches at the edge of the tree. I checked the pines to the south of the nest, periodically whistling in an attempt to get the fledglings to reply. Nothing. I then started up the hill beneath the nest tree and to the north. A screeching Blue Jay west of the nest caught my attention. It took a couple of minutes of scanning the treetops, but I eventually spotted the Blue Jay. He was perched near the top of a mature London Planetree. Below him, at about 10 o'clock, sat one of the recently fledged red-tails. The jay's alert calls brought in a mockingbird and the two songbirds took turns diving at the young raptor, attempting to drive it off. The hawk stood his ground and the two smaller birds flew off in opposite directions. 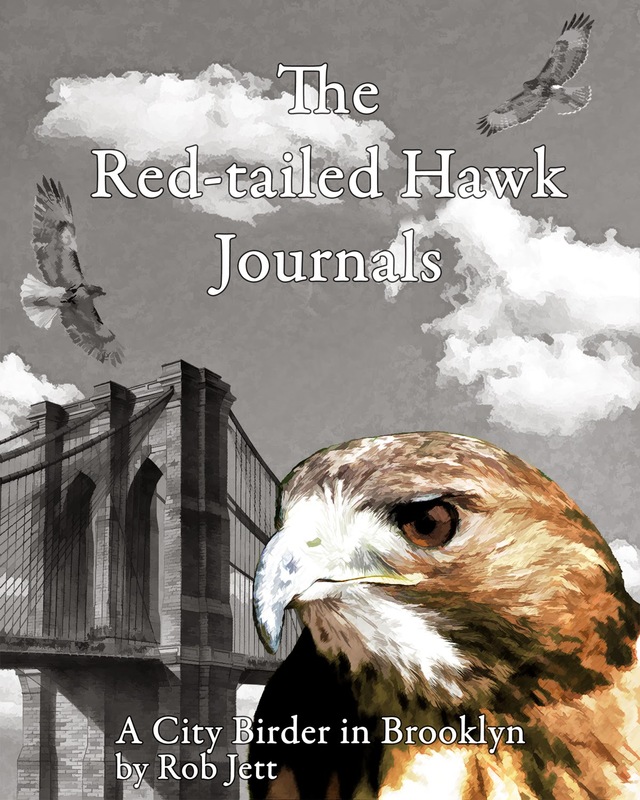 I've watched this mobbing behavior hundreds of times and newly fledged Red-tailed Hawks are usually easily intimidated. Some will go so far as to start whining for their parent's assistance. This bird, however, didn't even flinch. Instead, he positioned himself facing the nest tree, ready to return home if either parent showed up with food. I settled down in the shade at the base of an adjacent planetree, hoping to see or hear the second fledgling. I estimate that it has only been a couple of days since these hawks had made their first flight out of the nest tree. They usually don't venture very far and still rely on their parents to bring them food. Within a couple of weeks they should be hunting on their own, but still not too far from their nest tree. The second fledgling never appeared and, after 30 minutes, I decided to go look in on the owls. Over the last 4 years I've learned that the owls use several spots as daytime roosts during the Spring and Summer months. Once Autumn rolls around and the deciduous trees drop their leaves, the pair returns to favorite evergreen roosts. 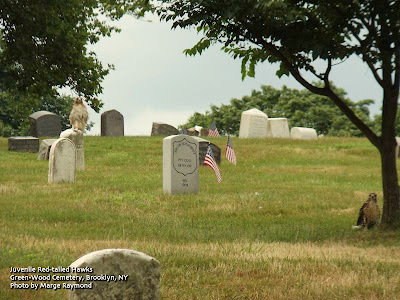 I was gradually working my way across the cemetery checking all their known roosts when a pair of old, cast-iron lions caught my eye, so I stopped to take some photos. It was at that point that I noticed a brown, furry animal walking slowly between the headstones several yards ahead of me. He didn't appear to see me, so I backed up and positioned a headstone between us, to serve as a blind. 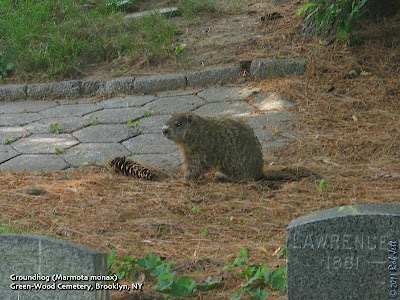 On the few occasions when I've come across groundhogs in the cemetery, they have been very shy and scamper away the moment they see me. This animal was acting a little peculiar, though, so I decided to follow him. The first thing that struck me about him was that he didn't seem to be moving in any deliberate direction. He was meandering and would periodically stop, turn around, as if looking over his shoulder, and circle in a counter clock-wise direction. The headstones and monuments worked great as blinds. Each time the groundhog would move a few yards, I'd duck behind another piece of carved stone. The more I watched him, the more concerned I became for his health. In addition to his apparent random travel throughout an area about the size of a football field, he didn't seem very robust in size. 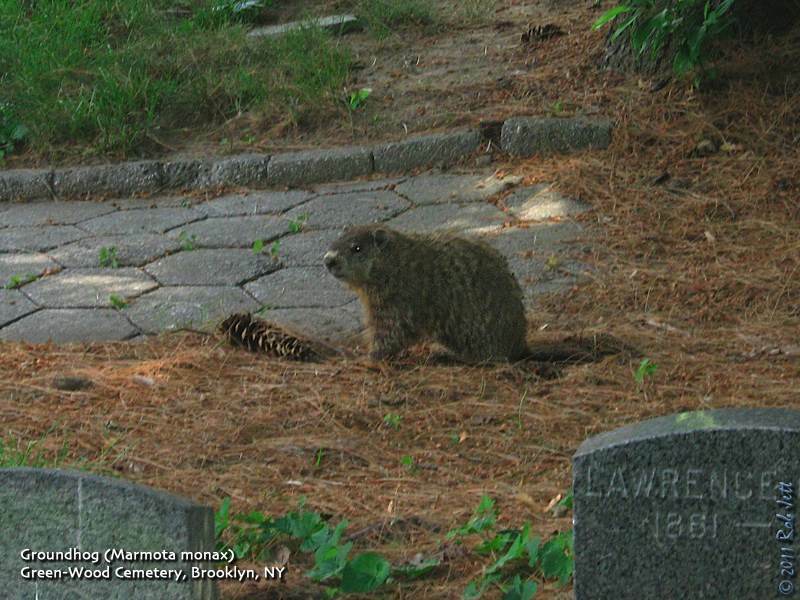 All the other groundhogs I'd observed in the cemetery were, well, portly. Also, a couple of times I popped my head up from behind a blind to find that he was right in front of me. He would stare at me for a moment before slowly continuing on his way. I called Cathy and Bobby hoping they could shed some light on this animals behavior. Cathy didn't sound very optimistic. She and Bobby have received sick groundhogs at their facility in the past and once these animals begin behaving erratically, it's usually too late to save them. The main cause for their illness is related to raccoon feces. I continued to follow him despite the bad news. As I watched him it occurred to me that perhaps he is relatively small because he is still young. 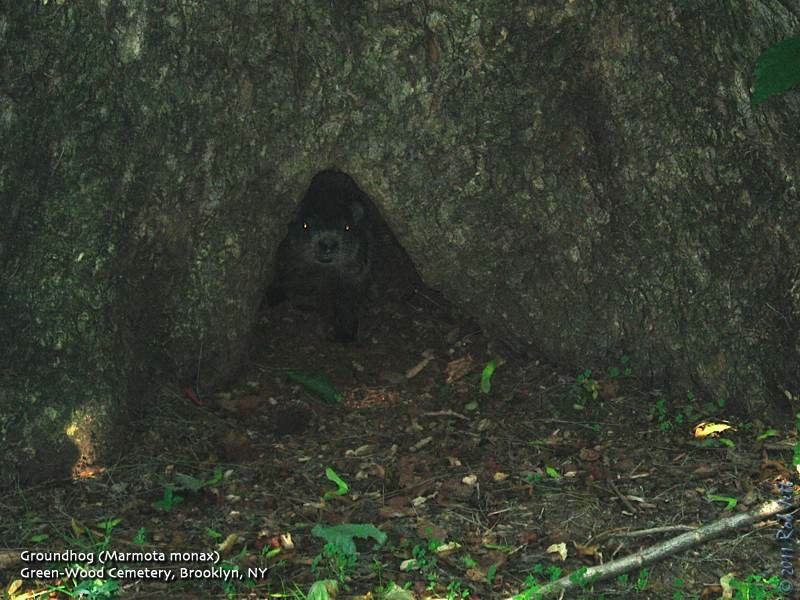 Groundhogs are solitary animals, so maybe this is a teenager who is heading out on his own for the first time. Could I have caught him looking for his own territory? At one point, I had to come out from behind my "blind" and startled him. He ran a few yards, then ducked behind a granite headstone engraved "Bacon". I stood behind a pine tree and waited for him to emerge from the opposite side of the stone. When he didn't come out for a few minutes, I slowly walked towards "Bacon". What I observed when I peeked out around the stone was very sweet and made me smile. 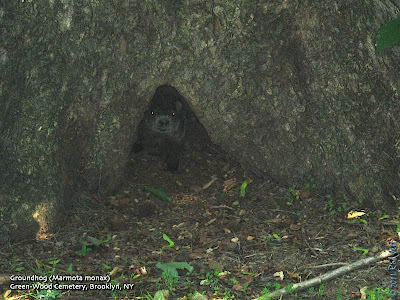 The groundhog had found an opening at the base of a tree that he was exploring as a possible den. I guess he found it acceptable, because he began marking the outside of the tree with the glands on the sides of his face. Inside the tree, he started digging a hole. Between short bursts of digging he would lie down at the entrance to his new home and rest his chin on the ground. 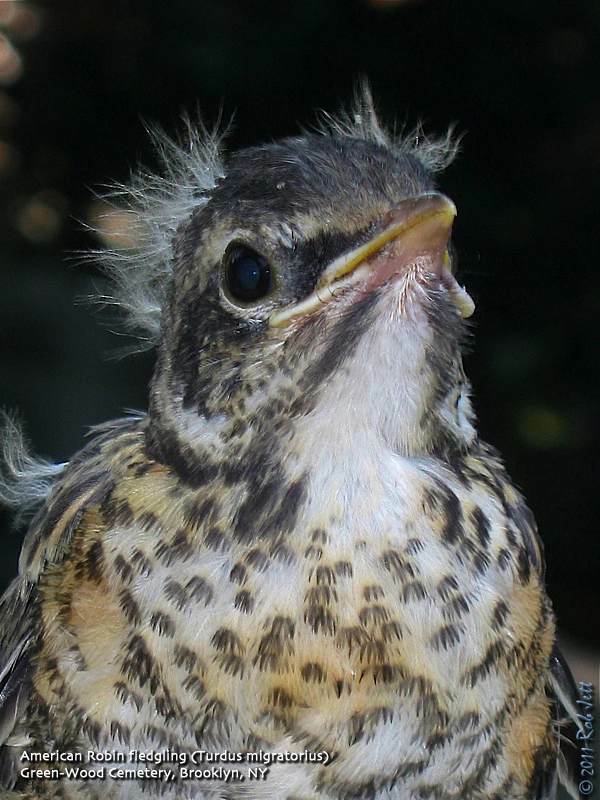 American Robins around New York City are so prolific that most are currently raising their 2nd or 3rd brood. I rescued this little one from certain death as it hadn't yet learned not to play in the middle of the street. Could this be Grandpa Munster reincarnated? "EFA Project Space, Flux Factory and The Gowanus Studio Space present SEAWORTHY, an exhibition and series of public screenings, performances, lectures, workshops and artist-led excursions on the water. With 72 islands and over 700 miles of coastline, New York City is a formidable archipelago. This project will invite discussion of issues surrounding water access and use, activate the largest open space in the city, and engage with relevant themes in contemporary art practice. SeaWorthy will bring together artists from here and abroad – in consultation with boat builders, world-class mariners, historians, writers, activists and ecologists – to make new work about, around and on the waterways of New York City in Summer 2011." See their website here for more information. Meet at Boathouse at 9:30 a.m.
Meet 10 am at Jamaica Bay Refuge center for a hike around the West Pond to look for mating horseshoe crabs and shorebirds. WQe'll also look for diamondback terrapins coming ashore to lay eggs. Bring boots and binoculars. Dress warmly as it is cooler on the water and bring binoculars. Give yourself enough time to park on Emmons Ave. or side streets and check signs. 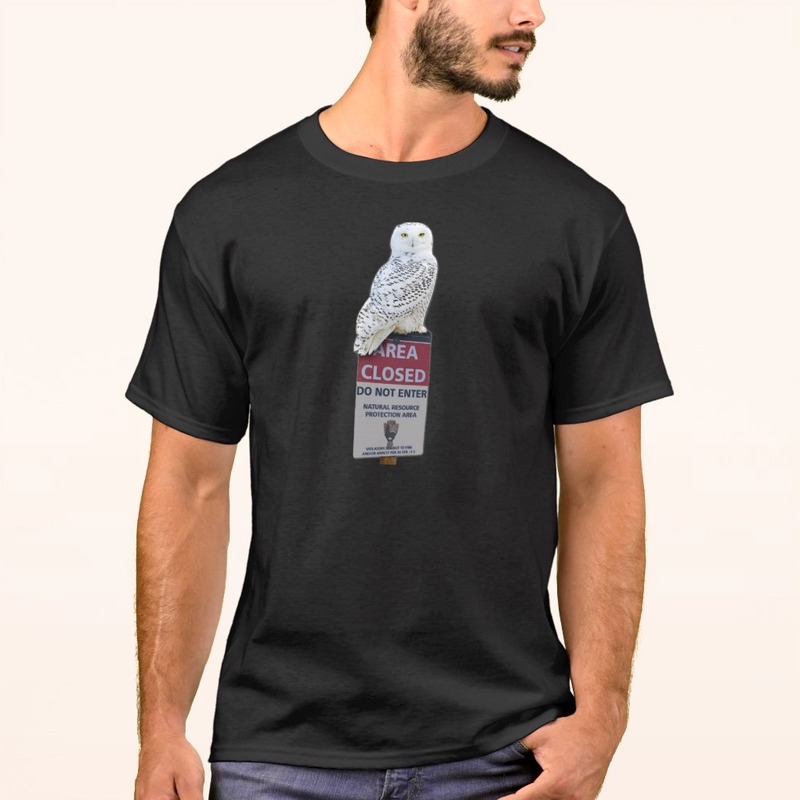 To reserve, send check to Don Riepe, 28 West 9th Road, Broad Channel, NY 11693. 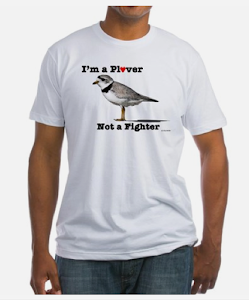 (Make check out to American Littoral Society). By car ( heading east on Belt Parkway). Get off at exit 9a ( Knapp Street) and make a right at the first street you can ( one way). Go to end ( Emmons Avenue). Make a right and continue about ½ mile to Bedford Avenue. Park on Emmons Ave. or side streets. Take the Q-Train to Sheepshead Bay station. Turn right after leaving station and walk along Sheepshead Bay Road to Emmons Avenue. Boats are to your left. Walk to Pier 2 ( Emmons and Bedford Avenues). Lost? Late? Call me: (917) 371-8577 and I'll try to pick you up. If late, take car service or look for my gray Toyota Corolla as I will visit station to pick up stragglers. Note - The trip goes rain or shine (within reason). Any doubt about weather call (718) 318-9344 after noon on the cruise date for any last minute decision. Rain date: June 19. Saturday, June 18, 10:00 a.m. to 2:00 p.m.
Meet by the Maintenance Building at the intersection of Slosson and Drake Avenues. We will spend two hours removing alien invasive plants from areas chosen by the Natural Resources Group. If you don't have your own, Protectors will supply gloves and pruners (& refreshments). After the work session (our 180th consecutive monthly workshop), we will take a short walk over nearby trails. For more information call Don Recklies at (718) 768-9036 or Chuck Perry at (718) 667-1393. 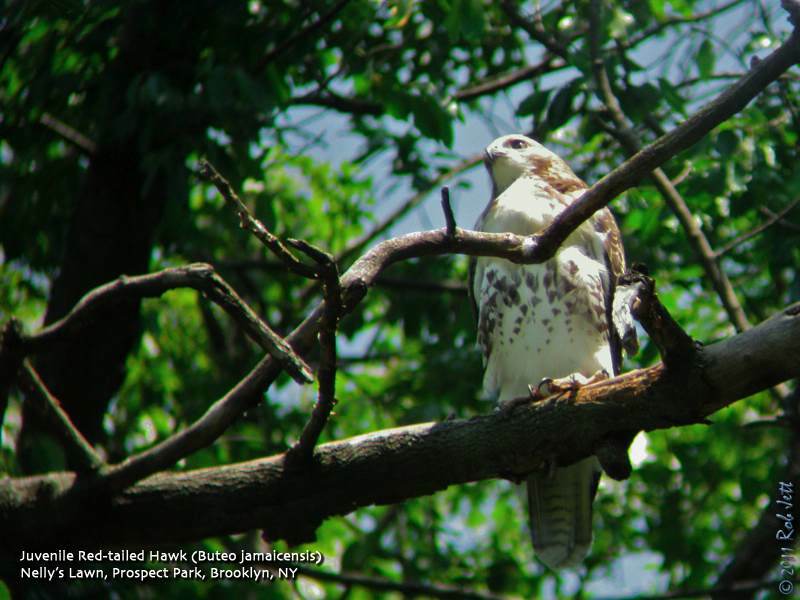 Join the Urban Park Rangers for early morning birding at Marine Park. Turtles, Salamanders and Snakes...Oh My! Let's walk through the park and try to fine the reptiles and amphibians coming out of hibernation. While sitting on my roof at sunset last night I heard then spotted a single Common Nighthawk flying back and forth above Prospect Park's Long Meadow. Nighthawks have been curiously missing from Brooklyn this spring so it was a welcome sight. I've always enjoyed the "peenting" sound of this bird as it reminds me of summer. Greetings. This is the New York Rare Bird Alert for Friday, June 10th 2011 at 10pm. The highlights of today's tape are YELLOW-THROATED WARBLER, KENTUCKY WARBLER, SUMMER TANAGER, CHUCK-WILL'S-WIDOW, GULL-BILLED TERN and LESSER BLACK-BACKED GULL. As we move into nesting season some interesting species on territory locally have raised concerns as to the safety of their selected areas and how prone to disturbance these birds might be. The YELLOW-THROATED WARBLER, singing recently at Connetquot River State Park, would certainly provide an excellent Long Island record if found to be breeding. Documentation of any nesting success of the pair of SUMMER TANAGERS present in East Hampton would also be very noteworthy so we need to very aware that these rare regional breeders need to be protected and certainly not harassed. Territorial birds can be observed without causing disturbance, including tape usage, so please remember that when visiting sites where rarities are present. This would also include KENTUCKY WARBLER on territory again at the Rockefeller Preserve in central Westchester and other very localized nesters such as VESPER SPARROW, GRASSHOPPER SPARROW and BLUE GROSBEAK. At Rockefeller Preserve maps to the park are available at the main parking lot. Other interesting birds at Connetquot River State Park recently have included ACADIAN FLYCATCHER and HOODED WARBLER as well as YELLOW-BILLED CUCKOO. 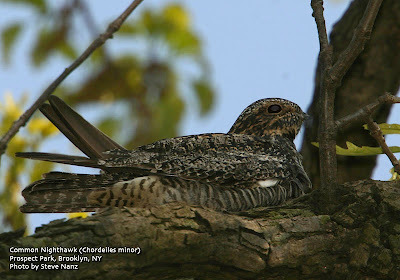 Another sparse nester, CHUCK-WILL'S-WIDOW, has not been showing up well this year so a welcome report was of four singing birds heard at mid Fire Island in the vicinity of Sunken Forest State Park on Wednesday. Also notable was a GULL-BILLED TERN at the Black Skimmer / Least Tern breeding area at Nickerson Beach just west of Point Lookout on Thursday. Democrat Point, at the western tip of Fire Island Thursday, at least six LESSER BLACK-BACKED GULLS were still present all in immature plumage mostly first year. Four ROSEATE TERNS were also present. Shorebirds out on the flats at Cupsogue County Park in West Hampton Dunes continue to change over as most of the breeding adults have pushed on. Lots of RUDDY TURNSTONES moved through last Sunday and a few WHITE-RUMPED SANDPIPERS today plus various non-breeding shorebirds have recently arrived but no very unusual terns have yet been spotted. Some ROSEATE TERNS still continue there. A large number of dolphins appeared offshore there last Sunday hopefully signaling the imminent arrival of interesting seabirds. In Central Park recently migrants were mostly memories. Not unexpectedly MOURNING WARBLER was noted early in the week while the last SUMMER TANAGER report came from back on the 3rd. We have no information on the SUMMER TANAGER reported in the New York Botanical Garden in the Bronx last Saturday. 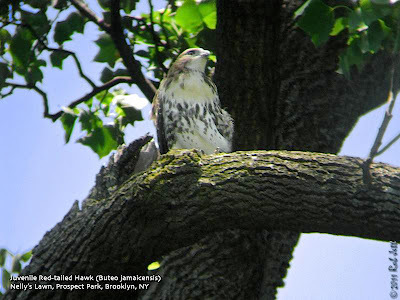 I went to Nelly's Lawn in Prospect Park to check on the pair of young Red-tailed Hawks. Only one was still in the nest tree, the second one having fledged. Max was keeping a close watch on the area from the top of nearby "Elizabeth's Tuliptree". There were several robins making alert calls from the dense stand of trees just to the north of the tuliptree, but I couldn't find the object of their concern - presumably the young red-tailed who had left the nest. The calling robins formed a loose circle surrounding a large European Beech tree, and two squirrels made "chuck squeal" danger cries from the beech's lower branches. The canopy is so dense in that area, however, that the hawk would have had to move or call for me to find him. At one point Nelly returned to the nest to check on the younger of her two offspring. She arrived empty handed (taloned?) and the juvenile whined in disappointment. I waited for signs of the second offspring for 90 minutes but had to leave before I was able to locate him. 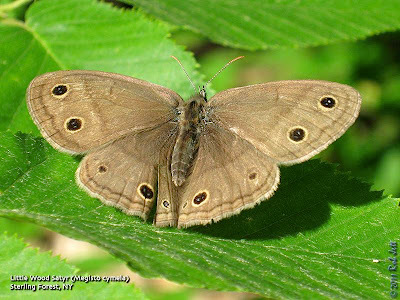 Spring songbird migration has ended, but all is not lost...there is suddenly a pronounced increase in butterfly species diversity and abundance. On a recent day trip to Sterling Forest State Park there seemed to be Little Wood Satyrs everywhere. Marge and I did a quick run into Prospect Park then over to Green-Wood Cemetery to check on the two Red-tailed Hawk nests. There are two healthy looking youngsters on the nest located at the East edge of Nelly's Lawn. One appears larger and bulkier than the other, so I'm assuming that they are brother and sister (females are always larger than males). Their mother stayed at the nest most of the time I was present and even fed the larger of her offspring. It was unseasonably hot and the sun was unforgiving. With little or no shade created by the now dead pine tree, the second young hawk remained obscured from view, in the nest's shadow. 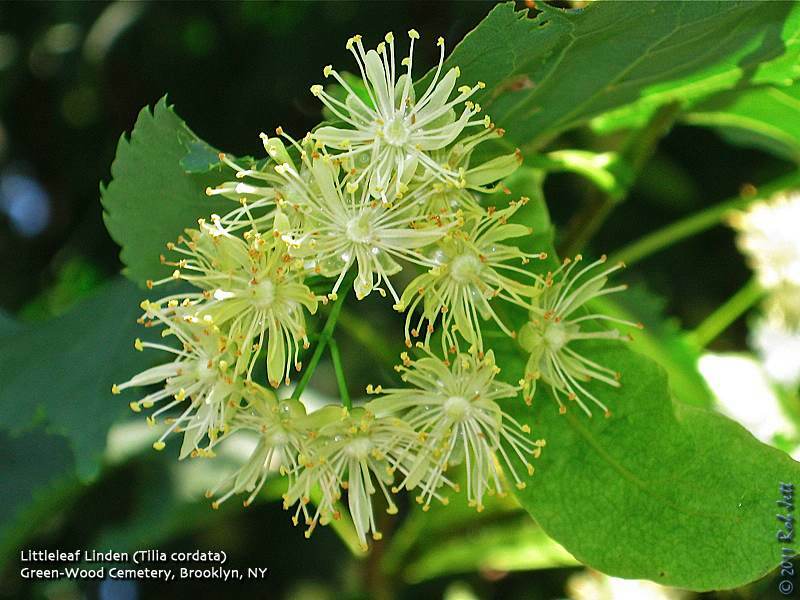 The nest in Green-Wood Cemetery is located near the top of a towering Little-leaf Linden tree. There are only a couple of narrow vantage points for viewing the nest, now that everything has leafed out. We were able to confirm that there are two young Red-tailed Hawks on this nest. 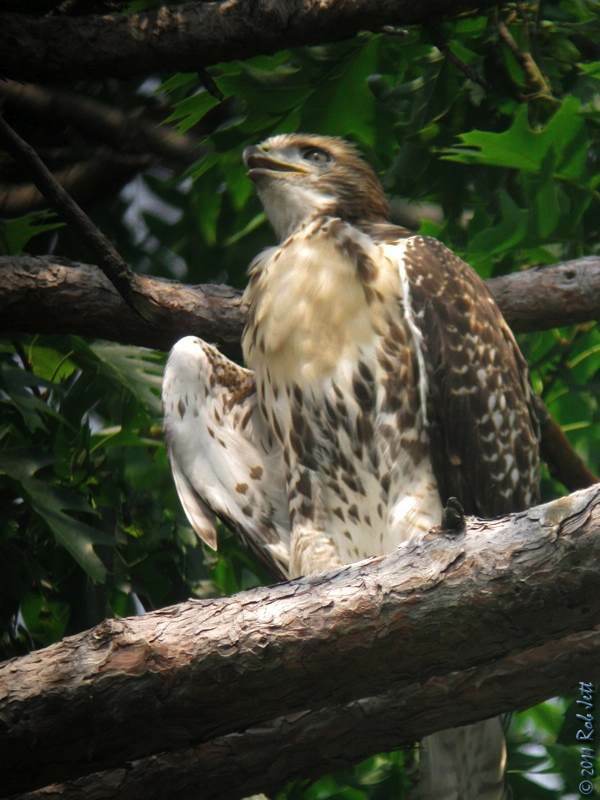 They still have a lot of their downy feathers on their head and face, leading me to believe that they are about a week or two younger than the Prospect Park hawks. Other than some brief periods of preening, we saw very little activity at the nest. Unlike Nelly in Prospect Park, Big Mama wasn't anywhere close by, or at least that we could see. Perhaps she feels that her young are safer in the cemetery. There is certainly a lot less human activity here. 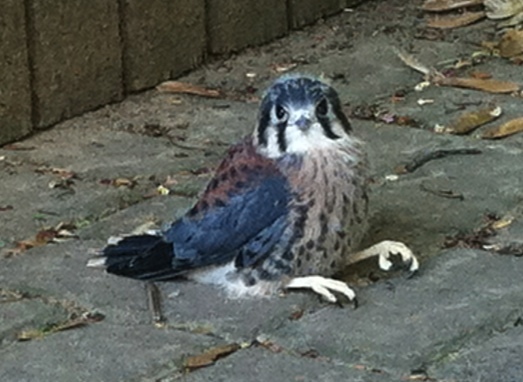 Every year around this time fledgling American Kestrels begin appearing on sidewalks, in city parks and, in this case, a community garden. Most of the time, with the watchful eyes of their parents, they are able to figure out how to stay out of harms way, but not always. 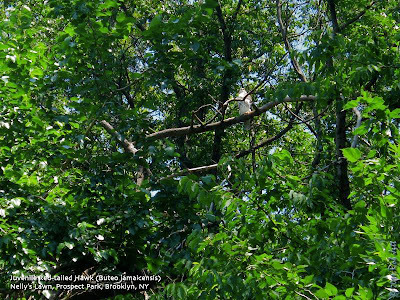 Thankfully, New York City has a growing network of protectors made up of raptor watchers, wildlife rehabilitators, park employees and the New York City Audubon Society who have been instrumental in saving these tiny falcons from injury or death. Two days ago a help call came in from 111th Street near Lexington Avenue. James O'Brien came to the rescue. I just received an email about an eyass in the NYRP Herb Garden at East 111th between Lex and Third. 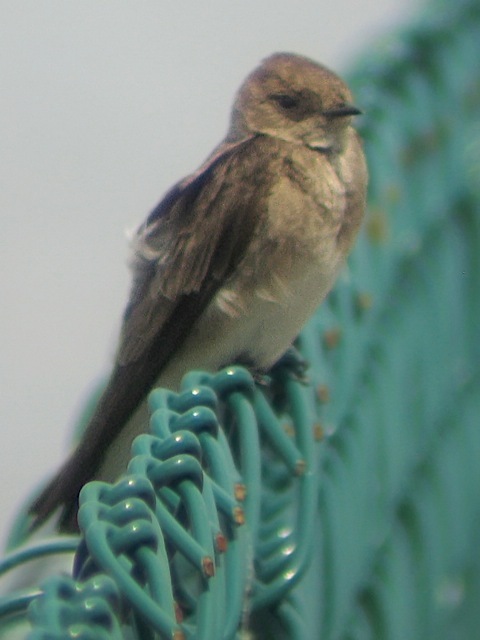 Does anyone know this bird? One of the people from the gardens wanted us to know about the bird and to help keep it safe. I'll go check it out...no redtail nests that I know of in that area. I'm guessing its a kestrel. I've been speaking with the resident who called this in and asked James to try to find a high spot to relocate the little male kestrel. Unfortunately leaving the bird in the garden isn't an option here since it is a cat community and at night the place is loaded with cats and Alicia said the 24 hour cat watch probably isn't going to happen. James is right -- it's a kestrel. I just spoke with the folks at the herb garden, and they sent me a photo of the bird. Their concern was that the bird was on the ground. It has hopped up to a park bench. It doesn't appear (to them) to be injured -- just a bit awkward. And they can hear the parent calling. They have closed the garden to visitors and will keep an eye out. I asked about the use of rat poison in the garden -- they are not using any. I'm glad James will stop by. :-) I have given James their contact cell phone number (and they have mine).